What Is Grooming A Show Cat Like? Ever wondered what it was like to show a cat? Are you curious about the grooming procedures in place for these beautiful show cats? We have some answers from two owners of prized pedigreed cats with a lot of experience in the show ring. For most of us, our pet cats usually know how to take care of their own coats quite well. Most owners don't have to ever wash their cat or invest in any special coat care routines. Things are different when it comes to showing cats competitively. Care for a show cat can get quite involved, requiring more than just a good brushing. It takes a lot of passion - and dedication - to show cats, as these extensive grooming procedures show. Here's the scoop on how to glam up a show cat. Persian breeder Lynda Smith of Posiepurrs Persians is also an established member of TheCatSite community. Many members admire the photos of her gorgeous longhair cats, but few know how much work goes into getting that perfectly groomed look. Lynda shows in Region 1 of the Cat Fanciers Association. Cat shows are year round with CFA shows running from May 1st to the end of April. Lynda is familiar not only with grooming longhair Persians. A cat show veteran, she knows first hand what goes into grooming various breeds. "In our club, we have Siberians, Selkirk Rex, Turkish Angoras, along with short-haired breeds like Oriental Shorthairs", Lynda told us. Grooming longhair cats isn't the same for every breed, either: "A friend has Norwegian Forest cats. Their bathing routine is a lot easier than Persians. To maintain the coat’s waterproof quality, she bathes two days before a show, not weekly." How is grooming a Persian cat different? "Sculpting" the fur around the cat's face. That includes removing the "devil horns" (tufts of hair beside the ears) and trimming around the face to round it out and around the eyes to make them "pop". Applying Goop (auto mechanics' hand cleaner) mixed in equal parts with water, to the dry coat - and rinsing it five minutes later. Washing with diluted Dawn dish soap, including lathering and rinsing. Shampooing with Chris Christensen clarifying shampoo, lathering and rinsing. Shampooing with a color brightening shampoo - lathered and left on for five minutes, then rinsed. Lastly, using Chris Christensen Thick and Thicker shampoo, which sits another five minutes before rinsing well. "For the cat I am showing now, I also use a conditioner and rinse. Best rule of thumb is to rinse longer than it took to shampoo," Lynda says. "Rinse until the water is clear and then rinse more. It is best to 'float the coat', which means letting the cat stand in the sink full of water so the coat will float away from the body. I wrap the cat in a towel and put him up on the grooming table to trim nails, easier to see the nail while the paw is wet." Lynda cautions against following that claw care routine with a cat that isn't used to being bathed. "Trim before the bath!" is her suggestion for inexperienced cats and owners. Grooming a Persian for a show is even more complicated! After trimming, Lynda's next step is to shave the cat's nose with a disposable razor so the black liner shows. Paper towels are used to blot as much water from the coat as possible, followed by Davis Mousse on a damp coat. Next comes blow drying the coat against the growth. The coat must be dried completely or it will get curly. Comb out again. Whew! When does this grooming take place? "I do this the day before a show, but other contestants follow a similarly complex routine on the day of the show. I do a quick touch up before we leave, dampen the ruff and blow dry, wash the face and comb. At the show, I comb as little as possible to keep the coat smooth, but pouffy." What about routine grooming for a Persian show cat? According to Lynda, between shows, a bath - at least weekly - keeps the coat in shape with most cats. This can change, according to the show routines and the individual cat's coat. "When I was running my boy Jack for a regional win I tried to do two show baths a week," she says. "The kitten I'm showing now needs to be combed daily due to the texture of his coat. Jack was combed just before a bath and right after." Things can sometimes get hairy! Of course, dealing with cats, there’s always a funny story to tell, too. “I was at a hotel for a show. I had to bathe Jack, and it turned out he was afraid of the big bath tub. At eleven pounds, he’s not a small cat. The hotel sink was tiny. I don't know who was wetter—Jack or me!” Lynda says. Diana Wilder breeds Burmese cats in southern New England. Burmese are single-coated Asian cats, and you might think they don't require a lot of grooming to show. You'd be wrong though. To really shine out in the arena and impress the judges, these cats have their own grooming routine, too. Diana shared some grooming tips and tricks with us. Cats, like people, tend to have bad hair days right after being groomed. Bathing four days before the show gives the coat a chance to settle back to normal. Use water that’s just above body temperature, testing it on the human wrist, as you might test baby formula. Find a shampoo that cleans without stripping the coat. "Most pet chains carry a line called Bio Groom with shampoos, conditioning rinses, anti-static spray, and other aids," she says. "Just make sure they are approved for use on cats. I can't stress too strongly the only human shampoo that should ever be used on a cat is a top quality plain baby shampoo. Anything else has chemicals that can be harmful to cats, including human cream or conditioning rinse." Make sure that all shampoos and rinses are out of the coat before drying. Don't use a blow dryer on a shorthaired cat. The heat of a human blow dryer can hurt their delicate skin. Diana puts her cat in a closed bathroom with a portable heater to air dry. At home, keep the claws clipped, the coats clean and the cat happy. Diana brushes her cats regularly, plays with them and generally fusses over them. They love it. Diana found that among cats, grooming shows love and care. A mother cat grooms her kittens, an alpha cat will wash a junior cat’s face. She's also noticed that if one of the cats is under the weather, gentle grooming makes him feel better. If you plan on showing a cat, here are a few pro tips for the big day itself. "On show day, the cat should be whisked into a show ring and have everyone gasp in admiration," she says. "Unfortunately, many cats develop goopy eyes and juicy sneezes five minutes before they are called into a ring. Be ready to mop up weepy eyes." Diana uses a good quality paper tissue or a cotton makeup pad, not a cotton ball, and keeps plain saline solution and Genteal eye drops handy. Other eye drops can be harmful, especially something that is supposed to 'Get the Red Out'. A comb with wide and narrow teeth, smooth, without sharp points, specifically for cats or dogs from a good pet store. It doesn’t have to be expensive, but helps to straighten the coat and prevent mats or tangles before they start. A microfiber cloth or chamois, washed, rinsed and squeezed dry to get dust out, smooth, and shine the coat. "Also - and this is important - it's fussing over the cat. It makes them happy," she says. A small-sized spray bottle of your anti-static spray to spritz on your palms. Rub your hands together and smooth the cat’s coat. Moisturizing eye drops like Genteal. Kleenex or moist wipes. Plain baby wipes will do, but check with your vet. Check under the tail so the cat won’t make a brown smear on the judging table. Diana hasn’t had this problem, but she's seen it happen. Toenail clippers for cats. Diana uses scissor-shaped clippers with a notch in the blades. Of course, you should trim the claws prior to the show, but it's good to have clippers on hand, just in case you need to do any last-minute claw trimming. A toothbrush with medium bristles to clean any litter from between the toes. Diana also talked to us about the mental preparation the owner needs to go through prior to a show. She has learned to do her best, understand that problems occur and sometimes miracles happen. It’s a show. Stressing out never helps. Keep your focus on the cat and her welfare. Whether in breed or household pet competition, the cat's the star. The owner’s job is to showcase all that is special and wonderful. "There is no such thing as ‘just a cat,’" she says. "All are special." Is grooming a cat for a show for you? Cat shows also have sections for non-pedigree cats, so just because you don't have a purebred does not mean you can't enter your kitty. But would that be a good idea? As the detailed descriptions by Diana and Lynda clearly illustrate, grooming a cat for the judge's ring is not exactly for the faint of heart. Grooming a cat for a show - even a shorthair one - is a long and complicated process. There's just a lot you need to do both on an ongoing basis, as well as prior to the show itself. Cat grooming for a show isn't cheap, either. Owners invest in expensive tools and products to make sure their kitties get the best - and safest - treatment possible. Of course, breeding show-winning pedigree cats is always expensive. Grooming costs and show fees are just a small part of what ethical breeders put into their hobby. Should you show your cat? Last - but certainly not least - there's the cat to consider. Not all felines enjoy or even tolerate participating in cat shows, including going through the extensive pre-show grooming process. As mentioned in this article, the cat must be happy and relaxed at all times in order to show his or her unique features. Breeders work with pedigree kittens from a young age to get them accustomed to the intensive grooming routine and the show experience itself. You could do the same with a mixed-breed cat, too. The younger the cat, the easier it would be to train her or him to enjoy grooming and shows. Just remember that not all cats have the temperament for cat shows - regardless of breed. Trying to give your cat a bath at home could be a good starting point. Follow our guide on bathing cats and see how Kitty likes it. 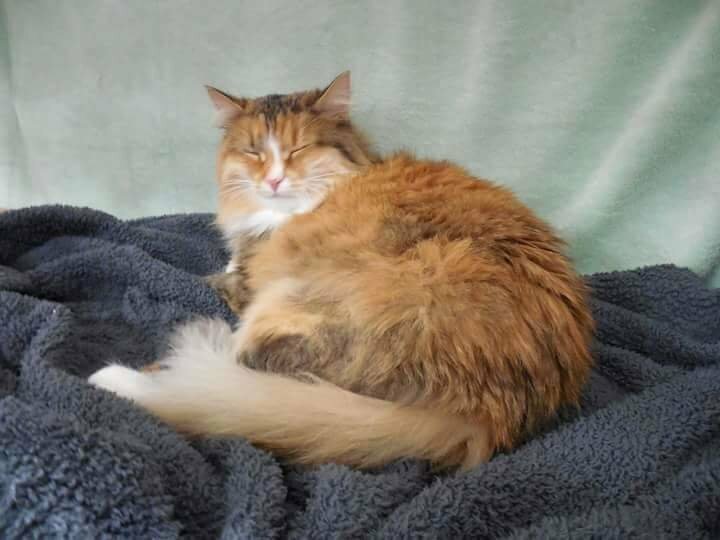 Have cat grooming tips to share? Have you ever shown cats? Do you have your own grooming tips to share? We'd love to hear from you so just leave a comment and let us know what your tips are! Midnight_The_Meowing_Cat and nunnc84 purraised this. Great article, and it makes me so relieved I live with a Russian Blue. All I've ever had to do with Mouse before a show is a quick claw trim and rub over with a damp microfibre cloth. It was his gorgeous fur and snuggly purrsonality that won him his awards. I used to watch the other humans at the shows fluffing and preening their kittens and cats and breathe a sigh of relief as I mussed up Mouse's velvet fur and settled him in to his den for the day. I only started to show him when he was two years old because he was far too energetic before then. I was convinced he would bite the judges and get banned for life but actually once he had calmed down he was a natural. He just sat back in his pen looking gorgeous and relaxed while his public adored him and the judges came round and gave him some much loved attention. He was quickly awarded with his male neuter Premier certificate (UK neuter cat equivalent to Champion for entire cats) but I decided not to continue showing him after his first year as it meant lots of car journeys which he didn't like as much as all the attention when he got there. 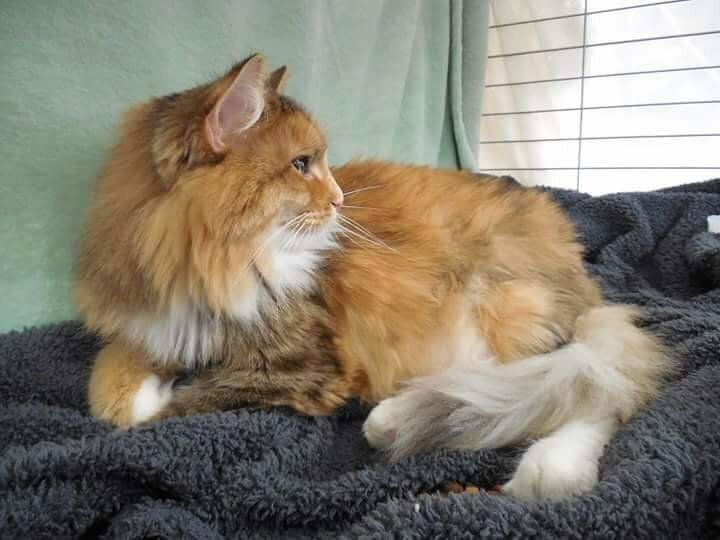 Honeybee was at one cat show in Vermont in 2015. She was in the household pet category. She didn't win 1st place but 6th, 8th, 9th, 10th out of 6 rings. Which I was estatic considering she wasn't perfect show material. I wanted to find out what breed she was-never did find that out. She didn't care for the handling from the judges but wasn't agressive either. Here's Honeybee in her cage waiting for the show. Good Lord! I need a nap after just reading about how hard this is. I can't imagine doing it! Whew! Just a couple of things. The silver cats in the photos are actually 2 different cats. The middle 2 photos are of Lottie, the mother of the other. I used her to show the difference that sculpting can make, even though she had a dirty face! Since she is retired from the show hall, she was NOT amused at the grooming! The other 2 are of daughter, Camie. For the cats that I show, even weekly baths are show bath with the exception of using Goop. I only use that just before a show. They are bathed from 5-6 weeks old, weekly so they are used to it. Silver and goldens are the only ones (I think) that you have to shave the nose so the liner shows. I loved this article! I have a blue and white van that I’m trying to get show ready. I’m new to this and all the instructions are very helpful! There's no way Forest Cat would submit to all of this pampering. It's a shame, I know he'd look lovely if he were properly groomed, but he doesn't like being brushed and he hates being washed. The best we can do is a yearly Lion Cut. foxxycat and segelkatt purraised this. Chamouti would love all this pampering and he also would look wonderful. He loves to be combed and brushed and would put up with everything I would dish out. But he is not fond of strangers and so would not do well at a show. Besides that the expense involved with a show is way beyond my means. Quiz: Can You Identify This Cat Breed?